Life of a Catholic Librarian: Tea Time with Tiffany #20 - Nervous Nellies, unite! 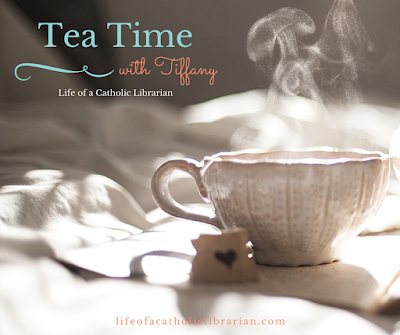 Tea Time with Tiffany #20 - Nervous Nellies, unite! I'll be posting again tomorrow, likely providing more detail about a few of things I mentioned today. Prepare yourselves for amusing dance anecdotes! Life has been a leeeetle busy lately, so I am playing catch up off and on today! From a quick scan of the other posts, it appears much of this is too little too late, but that's the way things are right now, at least in my world. Worrying. When I was in college, and for several years thereafter, I had the uncanny ability to cause stress-induced chest pain, so I feel you. My strategies (if you can call them that) are not that new or exciting. The first one is to make an effort to be aware of what my head is doing, as worrying is so automatic. I try to make an effort to think through what I am worrying about. It seems to help me if I can very deliberately acknowledge that either (a) I am inflating something that probably isn't that big of a deal except to me personally for some reason or (b) it probably isn't something I have the power to alter, improve or otherwise control with my worrying. A strategy for controlling the absentmindedness that comes with worrying is to prepare as much ahead for things that are coming up as I can. So, I try to keep up on laundry, I pack the kids's diaper bags the night before rather than the morning of, ditto for putting out the trash. I try to pay the bills early if funds will allow. *Sigh* (Embarrassing admission time) I text myself to do lists and reminders. This is in addition to calendar items. For some reason, the act of typing up a reminder or whatever helps to get it into my head better. Calendar items that have been set weeks in advance are too passive and easy to ignore. And then there are strategies for tamping down the worry that can't be reduced or eliminated by rationalizing - taking the time to do some sort of brisk exercise (even running the stairs several times at home), with some slow, deliberate stretches at night to help me relax to sleep better (loss of sleep is something that only exacerbates worry in my world). If I have the time and my brain is really on a merry-go-round, I will read out loud. Again, I have no scientific explanation, but it's something about how my brain needs to work in order to process the written word to verbalization that doesn't leave much/any unoccupied RAM to continue the swirlies in my head. Amy!! Always so nice to see you. :) You and I sound a lot alike, girl. :) Yep, I try to actually *force* the worry thoughts out of my head for the very reasons you mention. I likely cannot do anything about it, at least not at that moment, and acknowledging that always helps me to feel better right then and there. I also love lists, it makes me feel more "in control," if you will. Writing things down does help me to remember things better (*especially* lists of things that I need to pick up at the store! Otherwise, forget it), and it gives me a feeling of things not being quite so overwhelming as I'm making them out to be.